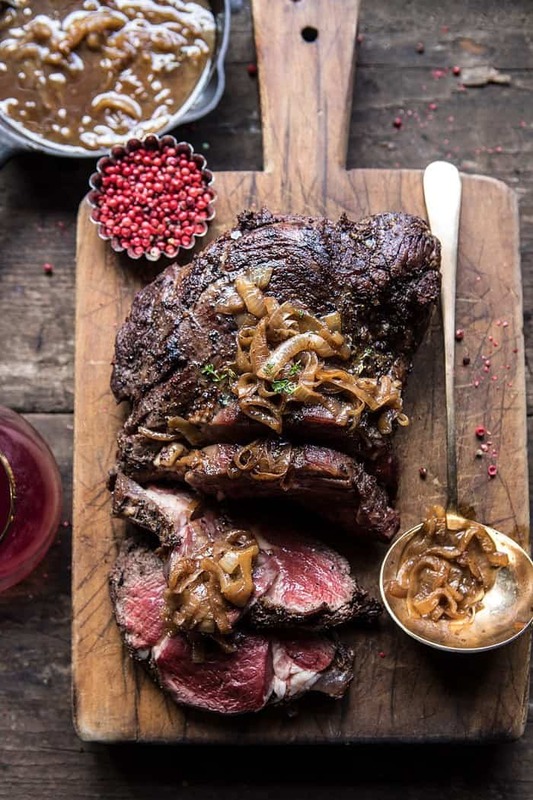 Home » BEEF RECIPES » roasted beef tenderloin with french onion au jus. Remove the meat from the fridge 1-2 hours before roasting. Preheat the oven to 475 degrees F.
Rub the beef with garlic, thyme, and season generously with peppercorns and salt. At this point, the meat can be stored in the fridge up to overnight. Bring the meat to room temperature before cooking. Arrange the onions in a large, oven safe skillet. Place the beef over the the onions. Add 2 tablespoons butter to the top of the beef. Transfer to the oven and roast until the beef registers 120 to 125 degrees F for medium-rare, for rare about 35-45 minutes, depending on the size of your roast. It's best to use a meat thermometer. Remove the beef from the skillet to a serving plate and cover with foil. Let rest 10 minutes before slicing. Meanwhile, set the skillet with the onions over medium heat. Add 6 tablespoons butter and cook, stirring frequently, until the onions are deep golden in color and caramelized, 5-10 minutes. Add the wine, beef broth, Worcestershire sauce, and thyme. Increase the heat to medium-high and bring to a simmer. Remove the thyme sprigs. Season to taste with salt and pepper. 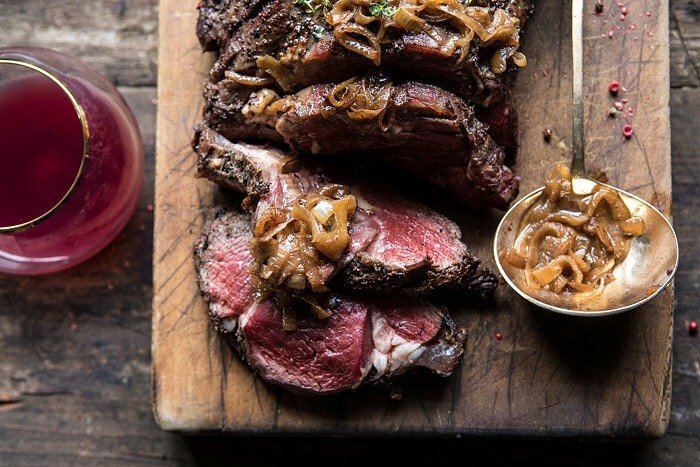 Slice the beef and serve with the French Onion Au Jus. 0 Response to "roasted beef tenderloin with french onion au jus."